The crisis arising from the Sinhala-Tamil student conflict at Jaffna University is a part of the Sinhalese establishment’s absence of conviction on the cardinal importance of secularism and the drift of the Tamil elite towards religious obscurantism. Conflicting nationalist narratives – as adaptations of received history to explain the present and direct the future – have, for each community, its inner logic. This is evident in how the Sri Lankan media has treated the Jaffna University’s first clash between Tamil and Sinhalese students. In this regard, the university has the opportunity of playing a constructive role in winning over its Sinhalese students through mutual understanding and respect, and thereby creating a base for demanding that other universities do likewise. That calls for courage, foresight and empathy. Unfortunately, following the mores of its Sinhalese counterparts, today the Tamil cause is being presented by extremists and is mired in meaningless symbols, purposeless rituals and the exclusion of ‘others’ from particular spaces. To understand the transition, we go back to the Vaddukoddai Resolution of 1976 – the definitive statement of Tamil separatism. The essential grievance in it is that the Sri Lankan constitution of 1972 gave the foremost place to Buddhism and obliged the state to foster it. These provisions were protected in the second republican constitution of 1978 as well. Whatever may be said in mitigation – for example, that the constitution also guarantees religious freedom to others – in effect, it is inequality and the denial of secularism. This, invariably, leads to the other principal grievance in the resolution: ‘Denying the Tamils equality of opportunity in the spheres of education, land alienation and economic life in general’. Sri Lanka’s security forces have erected Buddhist monuments in minority-dominated and war-devastated areas as symbols of possession. This, it would seem, is their skewed interpretation of the constitutional call to ‘foster Buddhism’. In 2005, under the cover of darkness and the backing of a hardline Sinhalese-Buddhist political party, the navy planted a massive Buddha statue in the Trincomalee bus stand. When the attorney general sought court action for its removal, the country’s chief justice arm-twisted him and the case was withdrawn. The events did nothing to ease the climate of the eastern city which was already seething with ethnic tension. Hardly any Sinhalese leader would dare to oppose such unlawful actions by the security forces that assumes the colour of patriotism. The proposed new constitution is almost certain to uphold the primacy of Buddhism and there is no consensus over the nature of the state – whether unitary or otherwise. As such, the content and language of the Vaddukottai Resolution, would continue to resonate with the Tamils. The grievances stated in the resolution are essentially about rights and inequality, and separatism follows largely on the premise that the Sri Lankan government is incapable of a just settlement. Devolution under provincial councils, that was offered grudgingly under the Indian pressure in 1988, has proved to be a futile counter to entrenched inequality. One would, on this reading, conclude that the most rational and painless first step for the government is to zealously enforce secularism and its counterpart, equality. It must be kept in mind that the Tamils long felt strongly about these grievances. Their nonviolent protests were violently quenched. As a community, they have been through a ruinous armed struggle in the last thirty years, whatever its rights, brutalities and follies. To ask them to accept the primacy of Buddhism in the new constitution, the effects of which are far more than symbolic, would make it rankle as a counterfeit made from base metal. Once culturally rooted, sectarian ideological claims become politically embedded and are extremely hard to reverse. The disease extends divisively. What the Sinhalese did with Buddhism, to their detriment, the Tamils are repeating. The Tamil nationalists who passed the Vaddukoddai Resolution prided themselves as being secular, and in word at least, tried to make common ground with the Muslims, whose language is also Tamil. Post war, this need was more urgent, given the shattered state of the Tamil society, economy and education. An articulate segment in Tamil politics has, however, taken on an adventurist course through building on the aggressive Hindu mobilisation by a section of the elites. This mobilisation was made possible by the political and moral displacement of Tamil society accompanying the LTTE’s rise, which finally left it naked at its precipitate demise, taking away even the opium of bravado. Hindu nationalism, already a festering phenomenon in Tamil run institutions, particularly in Jaffna University, attained a more open manifestation in the form of the northern province chief minister, C.V. Wigneswaran. His rise to power in 2013 signified a deep rot and was a sign of things to come. In November 2014, Wigneswaran attended a conference organised by the Vishwa Hindu Parishad (VHP) in New Delhi. There, he highlighted the immense loss of life and property that the Tamil Hindus had suffered in the war and called upon Bharat, the ‘motherland of the Hindus’, to succour the Hindus in the neighbouring countries. His sole focus on Tamil Hindus was particularly disturbing since Tamil Christians were as much under attack. Where this Wigneswaran’s plea takes the Tamils in Sri Lanka, is clear when it is placed alongside the VHP leader Sadhvi Prachi’s genocidal call to make India – a country home to 178 million Muslims, Muslim-free. Muslims living in the northern province, in what is starkly reflective of the Tamil experience under the Sinhalese administration, continue to complain about discrimination in areas of education and health. These are devolved matters which fall under the purview of the chief minister Wigneswaran’s provincial administration. They have spoken out strongly at the official consultations for transitional justice, while impressing others as trying to be scrupulously fair. Muslim civil societies have complained that in spite of having written several letters seeking an appointment with the chief minister to discuss their concerns, they have been ignored. Mullaitivu is one of the districts worst affected by war. Before the war came to the district in the mid-1980s and when the state forcibly moved to plant a large Sinhalese settlement, the Muslims had been allocated land in Koththiyakumpan in Murippu. However, they were forcibly expelled by the LTTE in 1990, before they received titles for their allocated land. The partial and transitory displacements that the Tamils suffered during the war became complete during the state’s final military thrust in 2009. When Muslims started returning with the Tamils in 2011, they all had to clear forests to establish their homes, often without permits from the forest department. We were told by the concerned senior government officials that the chief minister had urged a court action to evict Muslims who had cleared land without permits, but at the same time, to regularise holdings similarly cleared by Tamils. The location is near Kokkilai where the army has been trying to put up a Buddhist settlement on a private land owned by a displaced Tamil. The result is the anarchy of diverse authorities trying to carve out hegemonic spaces and fatally straining the unity of Sri Lanka. 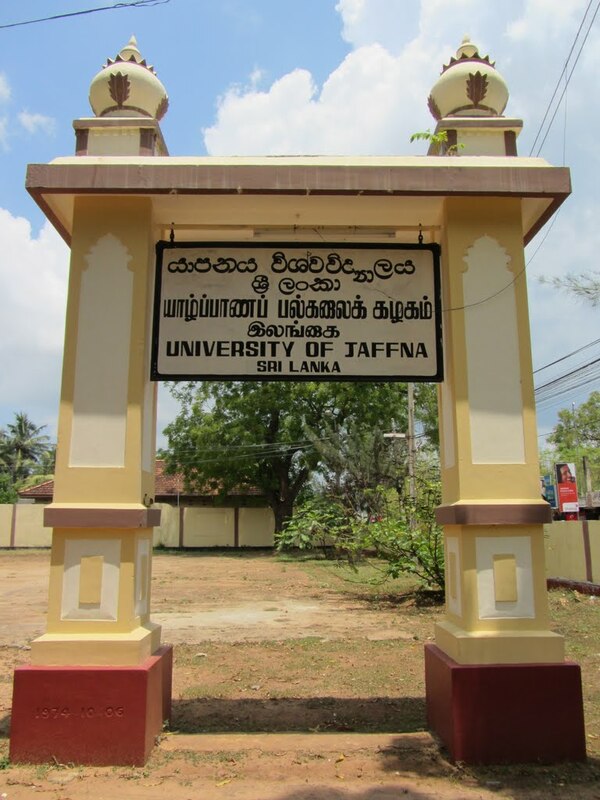 Jaffna University was started in 1974 by a financially strained government by taking over Parameswara College, a Hindu board school. The university was then multi-ethnic and its political colouring was determined by a strong core of Marxist academics. Political discussion cut across communal and religious boundaries and no one doubted or challenged its secular credentials. This was not affected by the Sinhalese students being moved out in 1977 consequent to the communal violence executed by the newly elected Jayawardene government. The change began when the LTTE in 1986 moved to eliminate all voices of dissent by terror and murder. By the end of 1991, most academics and students known for open dissent had been killed or had fled. By 1996, a successful military thrust had enabled the army to establish its presence in Jaffna even as the LTTE’s terror network remained active. The university itself came to be dominated by a group of conservative academics who detested the university’s earlier liberating legacy and a new form of conformity was imposed. This meant genuflecting before the LTTE locally and giving assurances of fidelity to the fickle administration in Colombo. Previously when the university was a school for Hindu boys, it had a very modest and non-descript temple at the end of the sports field. The school’s priority was a modern western education. The group that took over the university in the 1990s began refurbishing and expanded the temple ritually and ideologically at the centre of the university. Devil chasing and Brahmanical ceremonies were incorporated into the opening of the new faculties in 2014. In filling academic vacancies, applicants with excellent credentials were turned down or suppressed if they appeared to be a threat to the new bosses. On some occasions, the applications received were deliberately ignored until the validity of the advertisements lapsed. A crisis began when Sinhalese students were admitted in increasing numbers from 2012 to fill vacant slots, especially in Science courses and where the instruction was in English. Two years prior to that and in conformity with the university’s new outlook, those in charge at the Science faculty adopted a new ‘traditional’ welcome ritual for freshers, where students garlanded the dean and teachers with flowers at the entrance and walked them in a procession led by drums and wind instruments like gods, both major and minor, are led in temple ceremonies. For this year’s welcome on July 16, 2016, some Sinhalese students wanted Kandyan dancing from Lanka’s central hills to be included in the procession. Many Tamils saw this proposed intrusion into the ‘traditional’ function as highly offensive. Academics who sensed trouble brewing informed a marshal and the senior student counsellor of their fear of an attack on the Sinhalese students by non-science students. An attack did take place two hours later, which was led by a group that was led by the president of the University Students Union, who was well-known to those in authority and whose actions, being forewarned, should have been prevented by them. Except for by one Sinhalese student, the injuries sustained during the clash were light. With the help from the police, the university authorities evacuated the science faculty Sinhalese students and sent them to their homes in the South. The greater damage was in the minds of people, done by things imprinted at that watershed moment, like the pre-eminence of Buddhism being written into the constitution in 1972. To avoid similar clashes in the future, the editor urges the university authorities to institute a rigidly puritanical behavioural code in dress and manners, which is to be strictly observed by everyone who functions in the university. These sentiments captured the way a large number of people responded to the event and, expressed in print, carried the ability to give intolerance, hypocrisy and anger, a new impulse and direction. It is about laying claim to the university as a hegemonic space. The closed atmosphere of wartime Jaffna has brought to the fore a new generation of academics, only some of whom have worked hard to read books and take in the best of the world’s heritage. What startled my older colleagues is that many of the younger academics, after this incident, angrily reject the suggestion that the university is a secular space and affirm its Hindu identity. The crisis is a part of the Sinhalese establishment’s absence of conviction on the cardinal importance of secularism and the drift of the Tamil elite towards religious obscurantism. The Sinhalese students must come back to Jaffna, but will the university put its house in order by radical re-education of those in authority? Indeed, there would have been no pretext for the incident had the university observed secular ethics. It is retaining Buddhist pre-eminence in the constitution, and its vividly demonstrated potential to kindle conflagration, that forces the state into greasy compromises with others intent on their own hegemonic projects. The rejection of equality and secularism condemns Lanka to pervasive instability. Rajan Hoole is a member of the Science Faculty Board at Jaffna University.